Following a solid 2017 (229 IPOs), initial public offerings on U.S. exchanges slipped in the first quarter of 2018. There were 51 IPOs in the first quarter; this was down 31% from the 74 companies in the fourth quarter of 2017 but 50% higher than the first quarter of 2017. In terms of gross proceeds, the first quarter of 2018 was the biggest quarter in more than three years. Gross proceeds from IPOs totaled $17 billion for the quarter, up 16% from the previous quarter and 28% from a year earlier. 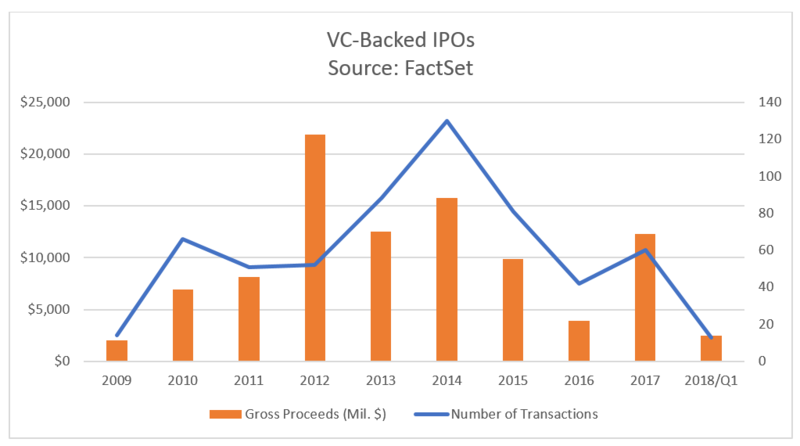 This means that in the first quarter, IPOs have already generated one-third of the total gross proceeds raised in all of 2017 ($50.9 billion). 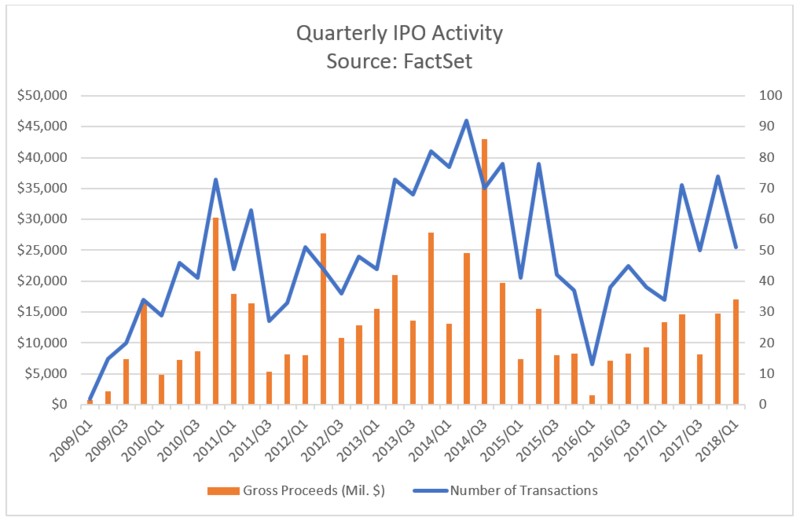 While we saw fewer IPOs in Q1, the offerings raised the most money since Q4 2014, highlighting the fact that the 2017 trend toward larger public offerings is continuing into 2018. 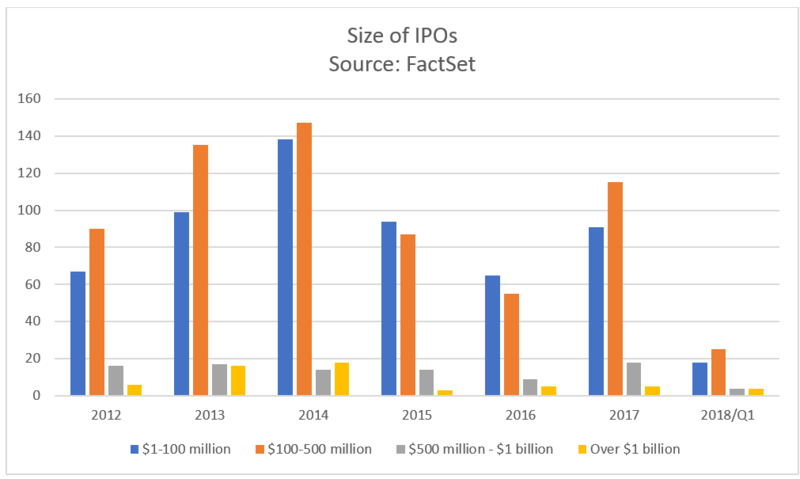 In Q1, IPOs with gross proceeds of between $100 and $500 million represented 49% of all IPOs, while 15.7% of IPOs raised more than $500 million, the highest percentage in five years. For the quarter, there were four IPOs that raised more than $1 billion, the highest quarterly number since Q4 2014. To put this in perspective, 2016 and 2017 each saw five IPOs with gross proceeds over $1 billion for the entire year. Of the 51 initial public offerings in the first quarter, 13 came from the Health Technology sector, the highest representation of any sector. This was a reversal from the 2017 trend toward the Finance sector, which led all other sectors in IPO volume in every quarter last year. However, the IPOs in Health Technology were smaller than the average for the quarter across all IPOs ($334 million). In Q1 2018, the IPOs in the Health Technology sector each raised less than $150 million, with the sector only seeing total gross proceeds of $1.1 billion. On the other hand, the Finance sector saw just 10 IPOs in the first quarter, but those offerings raised a total of $3.8 billion. This total included one of the four mega-IPOs for the quarter; the VICI Properties IPO priced on January 31 and raised $1.4 billion. The other mega-IPOs during the quarter boosted the gross proceeds for the Commercial Services and Technology Services sectors. Two IPOs raised over $1 billion in Commercial Services in Q1, propelling this sector ahead of the rest with a total of $4.1 billion raised. 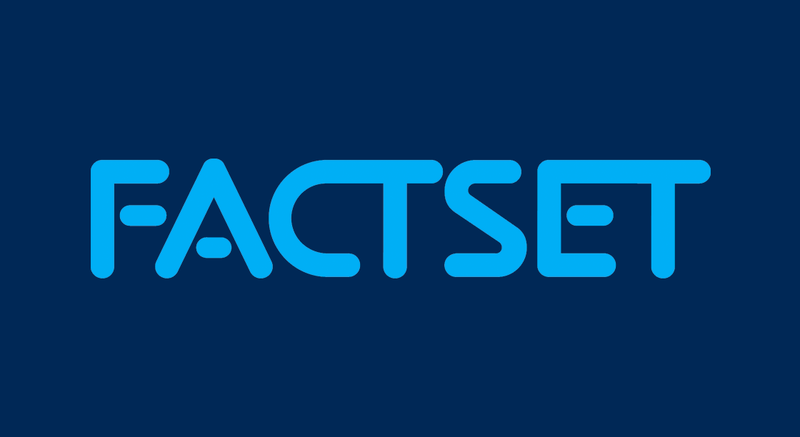 Those IPOs were Pagseguro Digital (priced on January 23, raised $2.3 billion), the largest IPO overall for the quarter, and ADT (priced on January 18, raised $1.5 billion). The Technology Services sector saw total gross proceeds of $3.8 billion, led by iQIYI (priced March 29, raised $2.3 billion). In 2017, only 99 of the 229 IPOs (43.2%) priced on U.S. exchanges were backed by financial sponsors, i.e. private equity or venture capital firms; this was the lowest percentage by volume since the midst of the financial crisis in 2008. However, things appear to be picking up so far in 2018, with the share of financial sponsor-backed IPOs jumping up to 52.9% in the first quarter. This is the highest share we’ve seen since the second quarter of 2015. In terms of capital raised, financial sponsor-backed IPOs represented just 46.7% of total gross proceeds in the first quarter of 2018. This indicates smaller IPOs backed by financial sponsors, on average. However, this was the highest ratio since the first quarter of 2017, when the Snap IPO boosted the ratio to 65.9%; the share stayed below 40% for the last three quarters of 2017. There were 13 venture-capital backed IPOs in the first quarter, down 50% from the fourth quarter of 2017, but more than double the number from a year earlier. 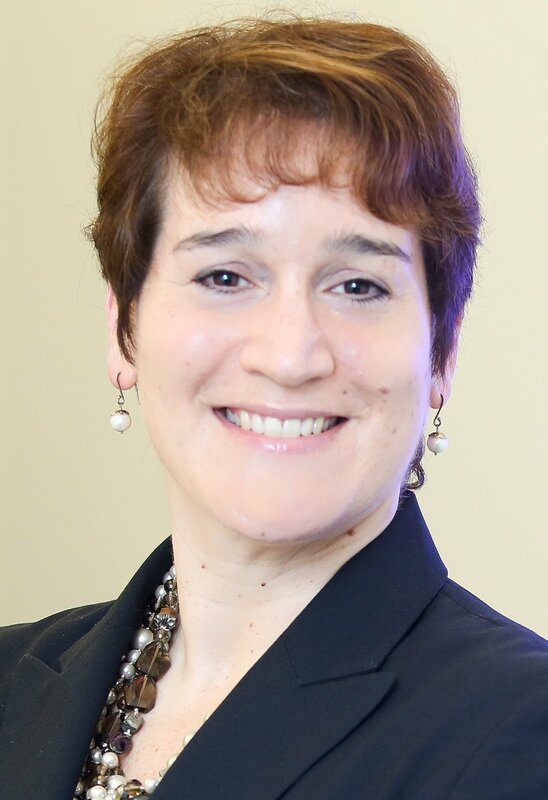 Gross proceeds totaled $2.5 billion, down from the fourth quarter tally, but the average issue raised $191 million, the highest since the first quarter of 2017. One of the most widely anticipated VC-backed IPOs was Dropbox, which priced on March 22, raising $756 million. The stock is up slightly from its debut, but it’s difficult to draw any conclusions on its performance based on the brief time since the IPO and recent market volatility overall. There were 14 private equity-backed IPOs in the first quarter of 2018. This matched the volume seen in the second quarter of last year, but still marked an acceleration from the trend over the last two years. Thanks to the IPO of iQIYI, PE-backed offerings had total gross proceeds for the quarter of $5.5 billion, the highest quarterly total since the third quarter of 2014, when we saw the giant Alibaba IPO. One of the most anticipated IPOs of the last year has been digital music service Spotify. However, the company announced last month that instead of going the traditional IPO route via Wall Street underwriters, the company would list its stock directly, allowing existing shareholders to sell their shares directly to the public. The stock debuted just this week, so we will have to wait and see how well it performs. If Spotify’s direct listing is successful, it could convince other tech firms to follow suit. One trend that we are already seeing is a surging number of Chinese (China and Hong Kong) companies listing on U.S. exchanges. Only two Chinese companies had IPOs on U.S. exchanges in 2016, but in 2017, this number jumped to 24, raising a total of $3.9 billion. This included Qudian, Inc., which priced on October 17, 2017 and raised $900 million, making it one of the largest IPOs of the year. In the first quarter of 2018, we have already had nine IPOs by Chinese companies, which have raised a total of $3.3 billion. This includes iQIYI, which raised $2.3 billion, making it the second largest IPO of the quarter. IPO Activity Reflects the Market Environment—What Does This Mean For 2018? Looking ahead at future IPOs, there are 33 companies that released initial preliminary filings in 2017 and are still in registration (this excludes offerings that have been postponed or withdrawn). In addition, another 35 companies have released their initial preliminary filings so far in 2018. Despite the surge in equity markets in 2017 (S&P up 19.4%), we still saw a tepid IPO recovery in 2017, particularly for financial sponsor-backed IPOs. Industry analysts have blamed the poor performance of high-profile IPOs in 2016 and 2017 partially on the general policy uncertainty regarding congress’ proposed tax reform legislation. The passage of the massive corporate tax cut in December 2017 was generally seen as a positive for IPO activity in 2018, but the return of market volatility in the first quarter could put a damper on activity in the coming months. 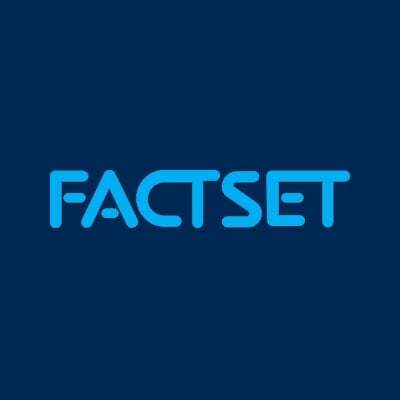 Note: All statistics are based on FactSet data for IPOs priced during the specified period for companies going public on exchanges in the United States.